My interview with Deborah Levine is the second in the series inspired by the response to my article, 2018 Challenges for Women Entrepreneurs and How to Overcome Them. Around the world, women entrepreneurs face major challenges, but many inspire us to establish the Golden Era of Women Entrepreneurship. 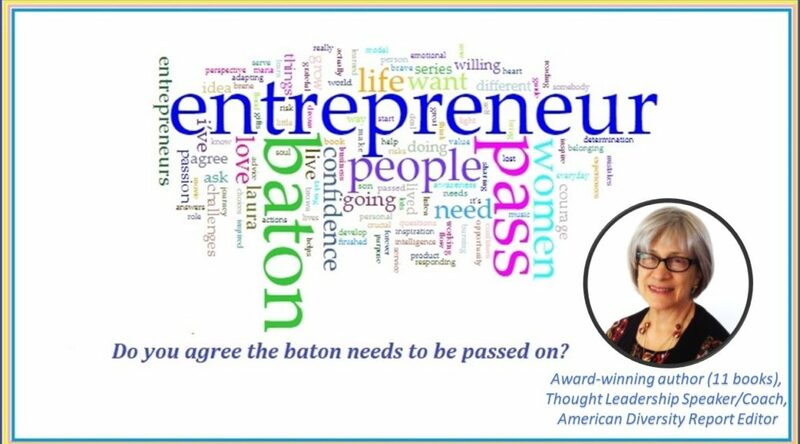 My interviews with these women leaders are truly amazing moments as they “Pass the Baton” on to aspiring entrepreneurs. Today I interview Deborah Levine, award-winning author of 11 books, Thought Leadership Speaker & Coach, American Diversity Report Editor & Podcast Host. She received a national press association award for her work and recognition in a national book competition. She received the 2013 Champion of Diversity Award from diversitybusiness.com and the Excellence Award from the Tennessee Economic Council on Women. Her writing about cultural diversity spans decades with articles published in The American Journal of Community Psychology, Journal of Public Management & Social Policy, The Bermudian Magazine, and The Harvard Divinity School Bulletin. She has written for The Huffington Post and been featured on C-Span/ BookTV. A popular speaker on university campuses, Deborah teaches and inspires both students and faculty. 1. Do you agree the baton needs to be passed on and why? The wisdom acquired by women entrepreneurs is invaluable. It gives me great satisfaction to pass along that wisdom in workshops, webinars, and coaching. Seeing an entrepreneur emerge, take control of her career, and blossom is one of life’s best gifts. On a more abstract level, there are a growing number of women entrepreneurs for a reason, one of those reasons being the lack of progress made in climbing the corporate ladder. If we change the fate of women who have opted to become entrepreneurs, we change the fate of society. Fortunately, we women are known to be community builders and societal bulwarks. Passing on the baton is part of our DNA. 2. Can you tell us a little bit of your transition from a regular job to the entrepreneurial pathway? What helped you the most to kickstart the journey? I began starting businesses in my twenties when my health prevented me from staying at my full-time job. At first, I thought of the business as temporary while I waited to get better. What I found was that those businesses answered a passion within me. And because I had nothing to lose, I gave every ounce of my energy, creativity, and intellect to developing them. When I did recover, I took traditional jobs. But I learned that my health wouldn’t last more than a few years in those positions and increasingly accepted that being an entrepreneur not only suited my situation but gave me a purpose in life that transcended my health concerns. 3. How do you prioritize your life and business in a way that lines up with what you value most? I make sure that regardless of what is happening in my business, that I take care of my health. That means that I eat a strict gluten-free diet and often vegan meals. This requires grocery shopping several times a week and preparing most meals for myself and the family. I don’t eat at any fast food restaurants so my regimen is time consuming. Because of these restrictions, I have friends over for dinner rather than eat out and make time to prepare and clean for these occasions. The kitchen is my gym, spa, and joy and healthy food comes before anything else. 4. What’s your advice to aspiring entrepreneurs on not missing out on promising opportunities? The issue of opportunities for aspiring entrepreneurs is an ongoing one of visibility, credibility, and flexibility. Visibility: Marketing yourself and your products and or services is a demanding enterprise. Everything from your name, your internet presence, your networking, and your visuals assist you in getting those opportunities. If you decide to do your own marketing, be prepared to spend several hour daily getting up and running, maintaining that visibility, and reaching out to new prospects. Credibility: Try to be as consistent as possible with the language and graphics that you use and make sure they match what you are selling. It takes several exposures for you to be remembered and if you keep changing your look and sound, it’s difficult for people to trust what they’re getting from you and your products/services. Flexibility: When meeting new clients, make sure they know that you can tailor your services to meet their needs. Provide a variety of packaged arrangements for different situations. Offer discounts when appropriate and rewards for repeat customers. Make your potential and returning customers feel that you care about their specific needs. 5. Scattered thoughts and frazzled emotions are something most entrepreneurs have to deal with, how do you manage/master them? Despite all my years as an entrepreneur I am subject to scattered thoughts and frazzled emotions like everyone else. I treat the scattered thoughts separately. They are part of the creative process and I sometimes write them all down so that I can organize them later. This is particularly helpful if it’s late at night. Sleep helps organize them and when I look at what I’ve written in the morning, I can often make something beautiful from my notes. Frazzled emotions are more challenging. Sometimes I exercise to get the adrenalin down and sometimes I meditate and do mindfulness exercises. Sometimes I just have to accept that I’m upset, or angry, or impatient. I know that part of the issue is that I’m a perfectionist. I try to remember while it’s sometimes a painful condition, in the end, being a perfectionist is a gift. I breathe and take a break so that I can use that gift to my advantage. 6. How do you acknowledge and manage the barriers and obstacles on your journey? I allow myself no more than 30 minutes to inwardly rage against barriers and obstacles. Then I force myself to shift gears and brainstorm with myself how to overcome them. Sometimes I call a colleague for advice. Other times I sleep on it. Being exhausted never helps anything. I do have some obstacles that are not going to disappear and dealing with them is the challenge of a life time. I had surgery a few years ago on some glands in my neck. My voice was affected and I easily lose it if I’m not alert to overuse. I have had to discipline myself as to how much I talk each day. I will sometimes have to save my voice for the entire day before I speak, coach or give workshops. While I’m not happy about this, as an entrepreneur I have the freedom to arrange my time and voice as needed. By accepting the obstacle, planning for it, I take advantage of that freedom and do those things that matter most to me. 7. One thing I’ve always noticed about entrepreneurs or self-employed people I’ve interacted with is confidence. What’s your golden advice on keep that light burning? Confidence is a term that is primarily applied to women and it isn’t a term that I use often. I feel that the lack of confidence is in reality a learned response to the negative pressures put on assertive women. Staying under the radar becomes an act of self-survival that can be used as needed and ignored as you see fit and are ready for the consequences. 8. Who are the most influential women in your life? Including those you’ve never met! The biggest influencers have been family members. None of them were entrepreneurs, but they had character traits that helped shaped me into an independent woman. My grandmother was born in the 1890s, had a high school education, and supported her family as an office worker during The Great Depression. We lived near my grandparents in my childhood on the island of Bermuda and her courage, energy, and unconventional view of women was a role model for me. Her two daughters, including my mother, both attended Ivy League women’s colleges in the States, making it clear that education was natural part of a women’s life and work. I followed them to Harvard and my female classmates were all ambitious, becoming scientists, computer programmers, artists, executives, and civic leaders. In the category of inspiring women that I’ve never met, I admire pioneering leaders including Eleanor Roosevelt, Harriet Beecher Stowe, Marie Curie, as well as those who have overcome disabilities to make a difference like Helen Keller. 9. Can you recall a specific time when a woman or the support of other women changed your life? I interviewed the interim dean (first woman to hold that position) of a college of engineering and computer science for my e-zine during Women’s History Month. Six months later, she hired me to be the first research coordinator of the college, helping faculty publish their work and teaching students technical writing. The opportunity gave me the chance to reconnect with my roots in science and technology, motivated me to reconnect with women I’d studied these subjects with in my youth, and improved my own writing. 10. Last question here, please tell us one book, movie or role model who changed the way you looked at things in life. I read The Alexandria Quartet by Lawrence Durrell when I was in high school. It was a fiction series based on Einstein’s theory of relativity: there parts space, one part time. I was fascinated at how a writer could use a multi-dimensional theory to produce compelling novels. Inspired, I have used a multi-dimensional model for my own writing, teaching, and speaking. The methodology has allowed me to be a futurist who anticipates consequences and can be creative in addressing them. Thank you, Deborah, for being you. Please continue to Empower and Inspire Women! I am a brand ambassador for beBee Inc, an ardent reader, a Purpose-Driven Career Strategist and HR. My passion is to help create purpose-driven world around me. I encourage women worldwide to recognize and embrace their true potential as entrepreneurs and believe in themselves. The content put together is a source of information researched and compiled from various websites. The opinions expressed here are that of my own and does not represent anybody. The information shared must not act as an evidence or factual data but only as a means of getting a general idea about women entrepreneurship and To enhance women entrepreneurship.